Lately the art market has received flak from all sides and one interesting piece of news amidst all the negative press is that the Dutch government have announced they are having a serious crack at securing the return to Holland of the magnificent pair of Rembrandt portraits that belong to Eric de Rothschild. Last week the Dutch government pledged 80m Euros towards the paintings on behalf of the Rijksmuseum in Amsterdam who have agreed to raise the additional 80m required to buy the paintings. E160m seems a reasonable price for these paintings and most likely will seem a steal in a few years. The price exceeds the current publicly known institutional record of US$147m paid for two Titian paintings sold by the Duke of Sutherland to the National Gallery of Scotland and the National Gallery of London, in a joint acquisition, between 2009 and 2012. Rembrandt’s Portrait of Oopjen Coppit, 1634. 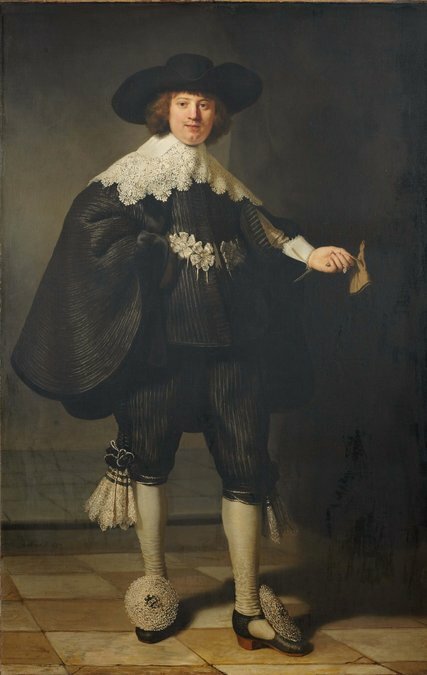 The two Rembrandt’s, portraits of Marten Soolmans and his fiancée, Oopjen Coppit, were painted in 1634, and remained with the family of the sitters until sold to the French banker, Gustave de Rothschild in 1877. Gustave’s great great-grandson, Eric de Rothschild, received export permission from the French Culture Ministry and Louvre Museum to sell the paintings overseas earlier this year, causing a furore in France. The leading French art publication La Tribune de L’Art observed, “Not so long ago, the Rothschild’s were great patrons of the French museums. […] He should have honored his name, approached the Ministry and the [Louvre], and agreed with them on a reasonable amount without seeking to obtain the highest price […] Eric de Rothschild is a member of the Société des Amis du Louvre (Society of Friends of the Louvre). Some friend!” However, it is Rothschild’s right to sell for the highest price should he so wish. The French Ministry of Culture are notoriously difficult about granting export licenses and normally freeze anything of quality, to lower the price by excluding international buyers, and thus allow for a French Museum acquisition. However, it reflects the influence that the Rothschild’s still exercise in France that the licenses for these paintings were obtained. It is hard to think of another country, and certainly not England, where a private seller could have obtained export licenses in this way for such outstanding paintings. The French Ministry of Culture and the Louvre have claimed they granted the licenses because they are strapped for cash. The French Rothschild’s have magnificent paintings including masterpieces by Gauguin and Ingres. That they have wanted to sell something has been whispered around the art market during the last few years with various tantalizing rumours of one or other of these paintings being available for the right price. But it looks like they have settled on the Rembrandt’s. Why the Rothschild’s should be selling these magnificent paintings is a mystery. Chateau Lafite, which they have also owned since 1868, and has been run by Eric de Rothschild since 1974, was doing well with cases of its 2000 and 2005 vintages selling for up to US$15,000, but prices have halved for certain vintages since 2011 and it is estimated that up to 70% of Chateau Lafite sold in China is fake. On paper Rogoth looks as impressive as Roubini. He is a professor of Economics and Public Policy at Harvard University and recipient of countless prizes and served as chief economist of the IMF from 2001 – 2003. And no doubt he is an excellent economist but, like Roubini, he has been dazzled in by all the art market froth and spin reported in the press, whereas reality in the general art market is that it follows closer to the law of diminishing returns. Reading what Rogoth says makes as little sense as Roubini’s art market speculations. More damaging to the art market is the progress of the current Yves Bouvier/Dmitri Rybolovlev saga in the press and the courts. Rybolovlev has charged Bouvier with overcharging him on US$2bn worth of paintings over 10 years on a misunderstanding concerning their commission arrangement. Rybolvelev has just returned 2 fine Picasso portraits to Picassos’ stepdaughter, Catherine Hutin – Blay. The portraits are of her mother, Jacqueline Roque. 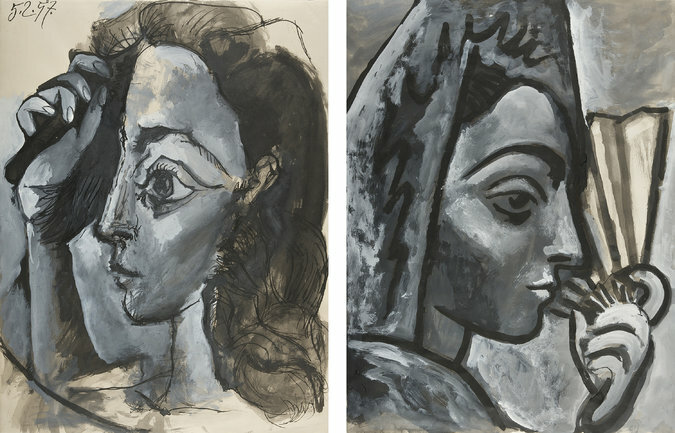 Femme se Coiffant (left) and Espagnole a l’Eventail (right), Picasso’s portraits of his second wife, Jacqueline Roque. The Picassos were sold by Bouvier to Rybolovlev but Catherine Hutin – Blay came forward and said they had been stolen from her whilst in storage. On returning the Picassos Rybolovlev said, “I feel solidarity with her (Catherine Hutin – Blay), especially as there is a strong emotional link between the portraits of her and her mother.” Bouvier says he believed he had bought them before selling them to Rybolovlev, “I am not crazy, I’m not going to sell stolen art to someone who has bought 2 billion in art from me. He was my biggest client. I am not a fool.” More ominously he added, “Just till now, I have been a gentleman….but from now on, I am the resistance and I will reveal the truth,” implying this story is far from over. The combination of the negative press drummed up by the economists and the lurid details of the Monaco court case are making all the banks nervous of dealing with art dealers and making art deals difficult from a transactional point of view. In fact, there are many reasons as to why the art market is fundamentally unsuited to money laundering. Money laundering suits businesses that have multiple small denomination cash transactions, the polar opposite of the art world. The banks now need more information than the buyers in art transactions with compliance becoming involved in every deal. All art deals in the major art hubs of UK, USA and Switzerland are subject to those countries strict money laundering legislation and auction records are a matter of public record. UK auction acquisitions have to be paid for by the named purchaser. Since neither Roubini nor Rogoth have ever had to try and process a major art transaction they should probably stick to sounding off on their own chosen field of economics. The advantage of economics is that it doesn’t matter if you are right or wrong in your opinions, as long as you sound good, and within a short period no one can remember what you said anyway. The Rembrandt’s have only been seen once by the public during the last 150 years and that was when exhibited at the Rijksmuseum and the Museum Boijmans Van Beuningen in Rotterdam in 1956. That they might now be heading for a museum, and being on public display, whether in the Amsterdam or a newly built museum in the Gulf, is welcome news for all admirers of Rembrandt. Since the deal is not done and the Rijksmuseum is seeking to raise the additional 80m Euros, if there is anyone advising those new museums in the Middle Easy who knows what they are doing, then they should be advising them to throw their hat into the ring with a higher offer. 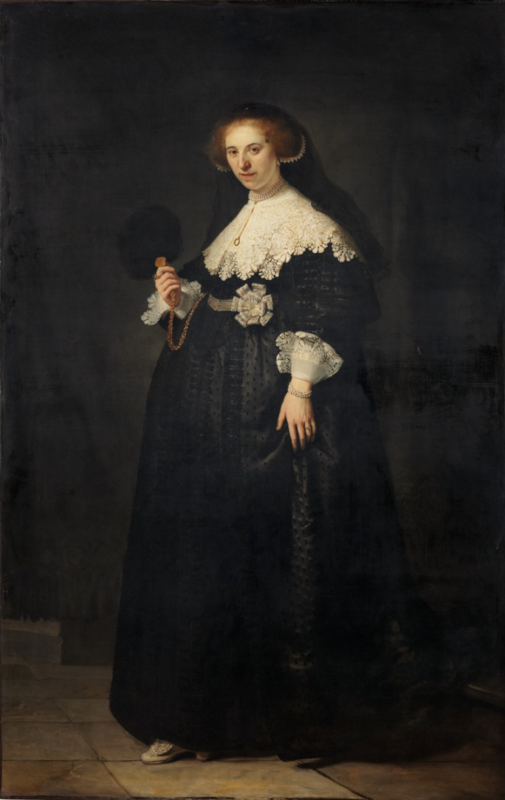 Rather than buying second-rate Picasso’s like the recent Woman of Algiers (US$160m), reportedly acquired by a Gulf Museum, these Rembrandt’s are exactly what they should be buying.